It’s March 1st. Already. I seriously don’t know how that is even possible. Wasn’t it JUST Christmas?? It seems that the year 2012 is already getting away from me. Most know that I write. If you’ve been reading my blog at all, then you know that most of what I post is about books or writing. Every once in a while I throw in something random about my family or a crazy craft I worked up the energy to do or something I’ve learned, but usually it has to do with my two favorite subjects. Reading and Writing. So today, I thought I would bring you up to date on my own writing process and where I’m at. You should get ready for this post. It’s going to be short. My update is: I’m still in the exact same spot as the last update!! I still have a picture book that I need to be sending out and querying like a mad woman, and I still am working on the first draft of a young adult novel. Yep, that about sums it up. I know you are wondering why I’m not more on top of things, and I give you a straightforward answer to that question. I can’t seem to keep track of my day! I find it extremely frustrating to know what I want to do “when I grow up” now and not be able to do it to the best of my ability. A husband, 3 boy creatures, a full-time teaching job, reading, reviewing, and volunteering at a few things keep me busy. But I don’t want to use any of that as an excuse. I very well could have used the two hours I spent watching Biggest Loser tonight writing or querying instead. I could have, but I didn’t. Instead I sank down onto my wonderful, faithful leather couch and vegged for a bit, while chatting on Twitter too. Does that mean I don’t want to finish this novel or get my lovely Bella picture book published? No. It doesn’t. For me, it means I’m still trying to figure it all out. And that brings us back to that crazy word that always seems to plague me: BALANCE. I’m not sure if I’ll ever master it really. 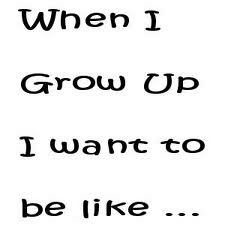 I’m imagining that you are asking what I want to be “when I grow up” since I mentioned it earlier, and it’s the title to this post. Most people will assume it is a published author (that is part of it), or what I am currently doing full-time (a teacher). But the truth is, in a perfect world, I would be in public relations for authors, illustrators, etc. This last year and a half has taught me some very important lessons. One-I am passionate about books and really great writing. Two-I am passionate about helping authors. It gives me great JOY to see authors become a success and know that I might have had just a little bit of a hand in spreading the word about them and their book. I get a rush when I do it and I feel “at home” in that world. So…when I grow up…I want to be in literary public relations…and then a published author. I would have never imagined that the published author might EVER come second to anything else, but it just did. That really did just happen. Don’t get it wrong. I’m still writing. Not as quickly as I once was, but I am still writing. And I’m definitely still dreaming and working toward that. This past year and a half has just been one of those times when I discover more about myself than I thought possible. I don’t know if you’ve ever had one of those times when you feel like you are in a time continuum and exactly where you are suppose to be doing exactly what you are suppose to be doing, but I’ve had several of those moments over the past year and a half. Every time I was helping promote another author or networking to help promote other authors. That has been eye-opening for me. We sometimes think we know all there is to know about ourselves once we become adults, and then something happens, and we realize we don’t. And that is my update. I like to think I’m not on the slippery slope between “when I grow up” and “when I retire”. Digging my nails into the ice and hanging on for dear life to never grow up. Yes! I would much rather my life crazy like it is than having nothing to do! Eventually those babies grow up and out of the house. I want to be well-rounded enough that I don’t go to pieces or wonder what in the world I’m going to do with myself when they do.